We've already seen spy shots of a facelifted version of the Civic Type R for the 2019 model year but before it arrives, Honda has unveiled a facelift for the 2019 Civic sedan and coupe. Of course, these are the versions that the vast majority of the public will buy, so it only makes sense to reveal them first. The exterior changes are far from drastic, but differences include a new piano black upper fascia, restyled lower fascia, bumper, and lower grille, a full-width front splitter, chrome side accents, and updated halogen or LED headlights. Honda has also added a new Sport trim, which sits between the base LX and mid-level EX. 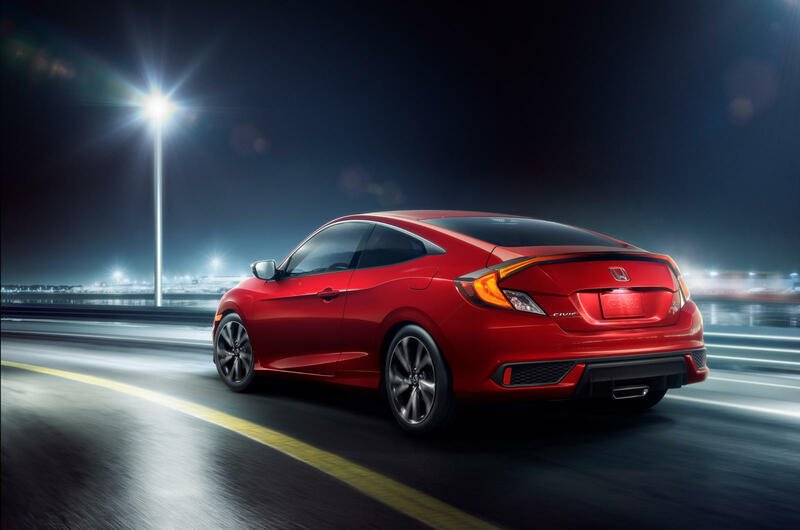 The Sport trim replaces chrome accents with gloss black and also adds 18-inch wheels and a center-mounted exhaust inspired by the Civic Si. 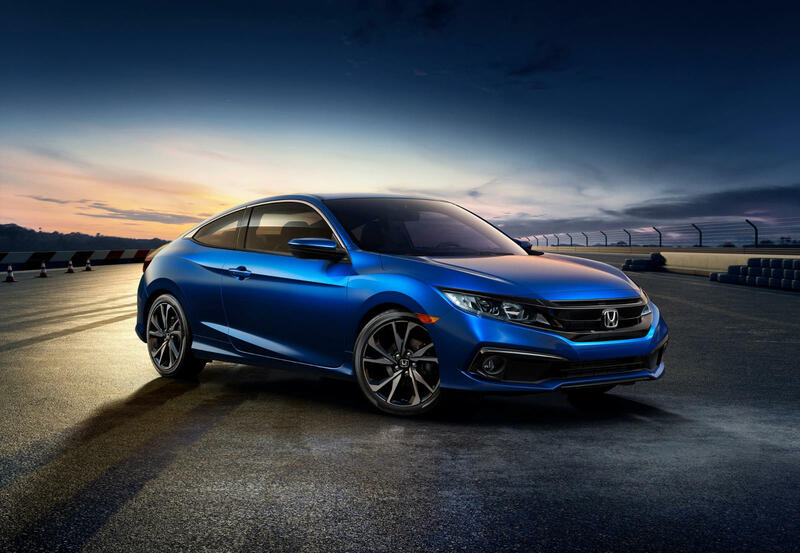 Unlike the Sport trim Civic hatchback, the coupe and sedan will be powered by the base naturally aspirated 2.0-liter four-cylinder with 158 horsepower, not the 1.5-liter turbocharged unit with 174 hp. Both the coupe and sedan are available with either a six-speed manual transmission or a CVT. Like the recently revealed 2019 HR-V and Pilot, the 2019 Civic will come with an updated seven-inch infotainment display which, joy of joys, now has a volume knob - no more having to fuss around with Honda's silly volume slider. 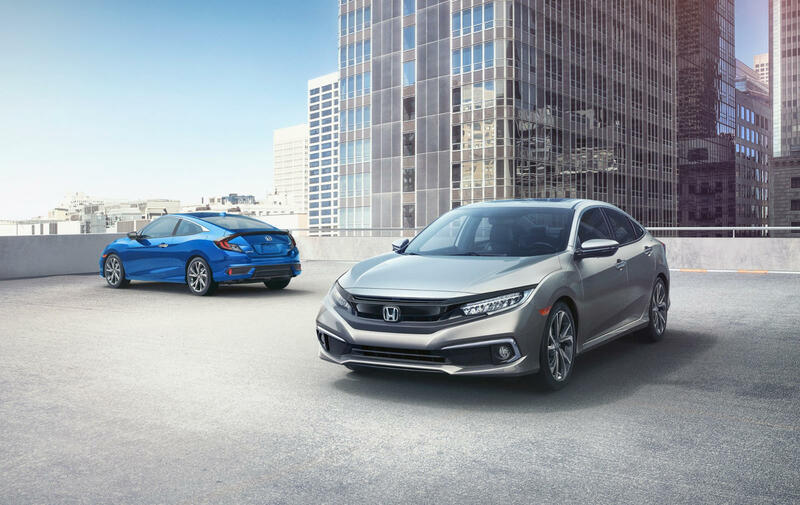 The 2019 Civic is also safer thanks to standard Honda Sensing technology, which includes collision mitigation braking, forward collision warning, lane departure warning, lane keeping assist, and adaptive cruise control. These are all welcomed additions that make the Civic an even better option in the compact car segment. Pricing was not announced but we expect it will be very soon as the 2019 Civic will soon be in dealerships. Yikes, I find the hatchback much better looking. The bar in the front grille is ugly, but at least it hides better in black. That single centered trapezoid exhaust tip looks pretty bad. It's too wide. It looks like a mod from Need for Speed Underground or something. I'd prefer the two exhaust tips of the Civic Hatchback Sport. I LOL every time i see the SI's exhaust.... i mean did Honda hire someone from Pepboyz? IIRC, the Miata Cup car is around $50k & doesn't include a seat/harness (driver size & preference). Looks infinity times better than the production CTR. Would hoon. With pride. For its 10th-gen Civic, Honda moved to a global platform that allowed us Yanks to finally take a crack at the Civic Type R -- a car that proved to exceed our lofty expectations. When news broke that Honda may shutter the UK plant where it's built, concern started to spread. But now, some news might send that concern back to the ether. 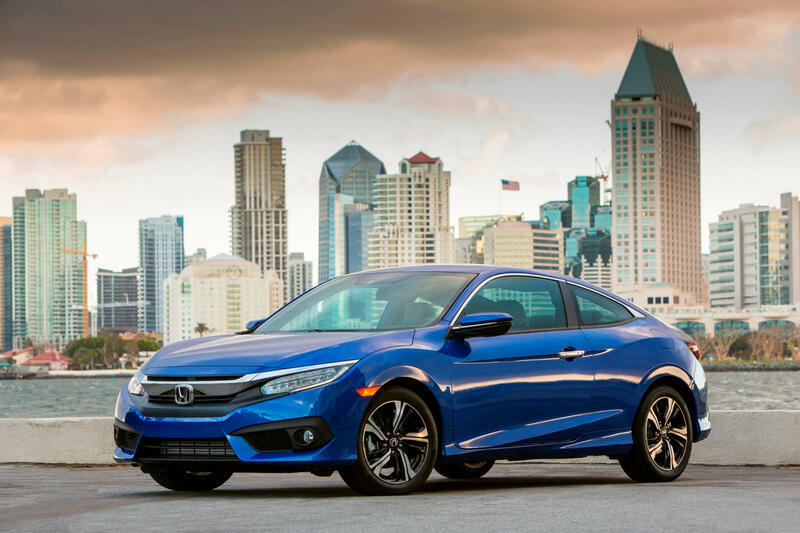 Honda will bring North American Civic Hatchback production to North America, Automotive News reports, citing confirmation from Honda CEO Takahiro Hachigo. 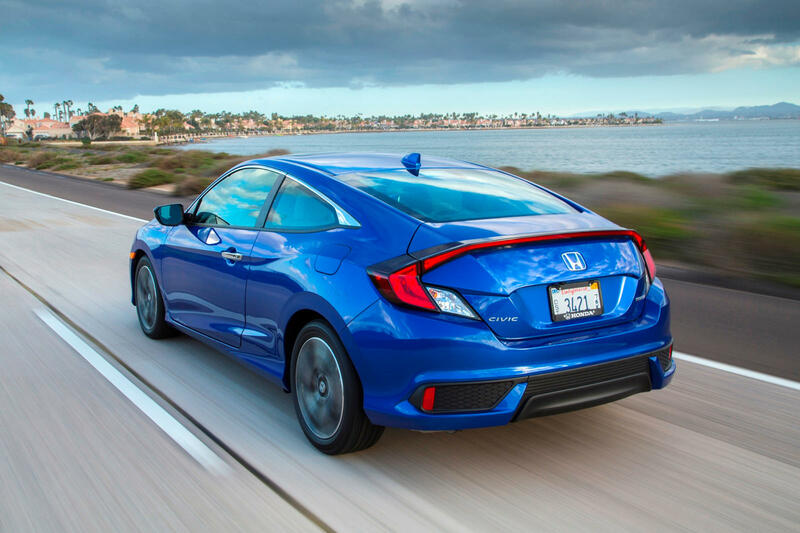 "Given our efforts to optimize production allocation and production capacity on a global scale, we have concluded that we will produce the Civic for North America in North America," Hachigo told AN. This is part of a greater shift in where Honda builds its global vehicles. It will end production of the current Civic Hatchback, including the Type R, in the UK and Turkey in 2021. Production will shift to Japan and North America, likely coinciding with the introduction of the next-generation Civic Hatch. Other variants of the US-spec Civic are manufactured in Indiana and Ontario, Canada. But the commonly assumed reason for closing the UK plant, which supplies the US with its Civic Hatchbacks, isn't the real reason. Brexit may be on everybody's minds, but Honda said in previous interviews that Brexit isn't actually the reason. Rather, according to AN's report, a new trade pact between Europe and Japan has made it smarter for Honda to just ship the cars from Japan to Europe. 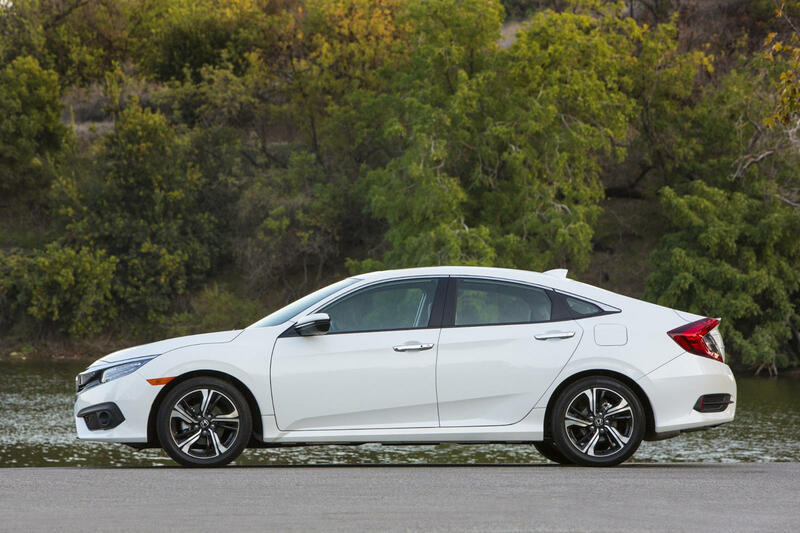 The Civic Hatchback may have been doomed in the US, had buyers not beaten Honda's sales expectations. 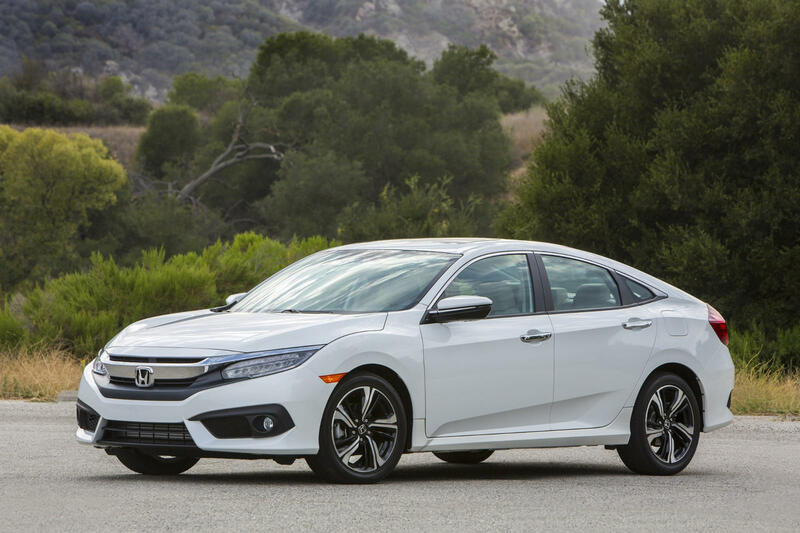 According to an email from the automaker, the Civic Hatchback's variants comprise 20 percent of Honda's Civic sales volume, more than the automaker honestly expected. It appears that not everybody is sold on the idea of crossovers, and the extra versatility of a hatchback may keep some Civic buyers from jumping ship to something taller. Six Civic Type Rs in contrast with each other, including the only sedan of the bunch. The Honda Civic Type R is arguably the hottest of the hot hatches in the world today. Its red Honda badge has been a symbol of performance for the Japanese marque – one that has been a forbidden fruit for the Americans ever since its introduction in 1997. But alas, the U.S. has finally got its hands of the latest Civic Type R and the world can be at peace now. With the iconic hot hatch's almost 22 years of history, it's inevitable that each of the five generations would be compared to each other. Considering that several MK1 Civic Type Rs are still on the road today, it isn't hard to get them all together. Such as this video from Youtube's Lovecars at the top of this page. For a brief history of the coveted red badge, read along. It all started with the Civic Type R EK9, which was introduced in August 1997. This first-generation model was a JDM classic and was based on the three-door hatchback Civic. With weight reduction measures and the use of the hand-ported B16B engine, the Civic Type R EK9 has one of the highest output per liter – 182 horsepower and 118 pound-feet of torque coming out of a 1.6-liter engine. Next is the Civic Type R EP3, which was based on the seventh-generation Civic. It's the first Civic Type R to be produced in the U.K., particularly in the Swindon plant, which is then shipped to Japan. The second-generation Civic Type R's defining characteristic is its almost-minivan styling and its 212-hp i-VTEC engine. The third-generation Civic Type R is probably the most intriguing, as Honda opted to build two types of it. While both types of the MK3 were based on the eighth-generation Civic, the Asia-exclusive model is a four-door sedan (FD2 chassis) and has a higher output than its European counterpart at 222 hp and 159 lb-ft torque. In comparison, the Euro-version FN2 has an output of 198 hp and 142 lb-ft torque, and still a three-door hatchback. The Civic Type R FK2 is the first of the red badge to bear a turbocharged power plant. It's also the one that lived the shortest, only hitting showrooms from 2015 to 2017. Regardless, its engine output has been raised to an outstanding 306 hp and 295 lb-ft of torque, mated to a six-speed manual transmission. The latest Civic Type R, the FK8, need not any introduction at this point. 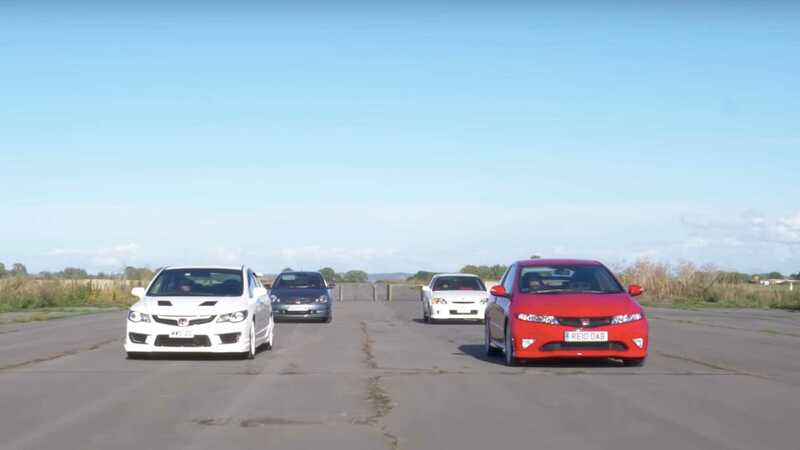 Watch the video on top of this page for the comparison of all generations of all generations of the Honda Civic Type R.
Had grand plans back when I had an EK coupe, to swap in a B16B, as a broke college student. Ek is awesome...So light haha! On top of being one of the most divisively styled cars in recent memory, the current Honda Civic Type R looks like it'll go down in history as the last CTR to be powered without some sort of electrification. 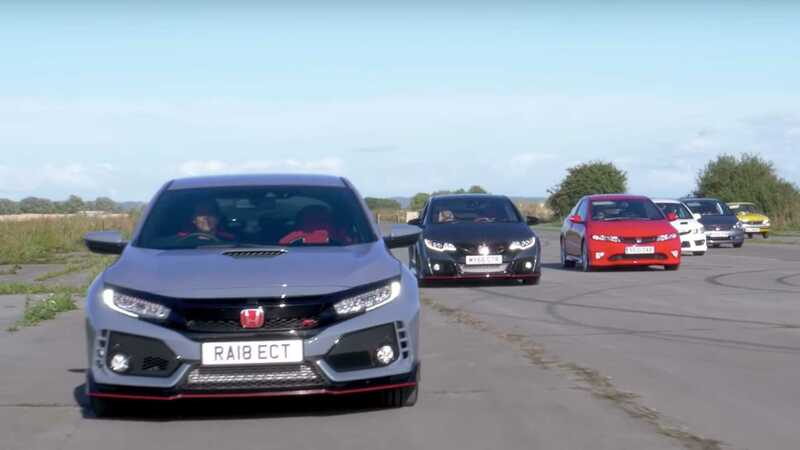 According to a report from Autocar, the next generation Type R hot hatch will be a hybrid, citing a new plan from Honda to have its entire lineup offered with some sort of electrical power in Europe by the year 2025. This is a more ambitious revision to a previous plan presented 2 years ago which saw Honda aiming to have two-thirds of all European sales electrified by the middle of the next decade. Naturally, the hot hybrid Civic will likely use tech trickled down from the company's electrified NSX supercar. While the mid-engined halo car uses a 3.5-liter V-6 coupled to a total of 3 electric motors, Autocar predicts the next Civic Type R to continue to use a 2.0-liter 4-cylinder paired with...some electric motors. We're thinking less than or equal to 3. "Since we made that first pledge in March 2017, the shift towards electrification has gathered pace considerably," said Honda Europe head Tom Gardner at the Geneva Motor Show. "Environmental challenges continue to drive demand for cleaner mobility. Technology marches on unrelenting and people are starting to shift their view of the car itself." What's more, Honda U.K. boss Dave Hodgetts told the British publication that the move was spurred on by just how well the company's hybrid CR-V has been selling. For every 10 CR-Vs sold in Britain, 6 of 'em are hybrids.